With over 40 years of recruitment experience, 3D provide their clients with a comprehensive and tailored service to supply and manage their workforce needs, matching candidates with clients in a professional and efficient manner. They develop strong relationships with both candidates and clients which ensures they deliver the right candidate first time every time. With a client list ranging from household names through to small, bespoke construction companies, the skills of the 3D sales and marketing team have to be top-notch. While 3D had been successfully running its own staff training in-house, MD Damian Doherty recognised that with a growing team operating in a very competitive market these key people need to be as sharp and effective as possible. So he turned to training experts Zest to develop and deliver a fresh, impartial and highly structured training programme to polish the sales performance of both new and longer-standing team members. We kicked off the relationship with a half day Discovery Session with the senior management team, drilling down into their objectives, looking at their current sales performance and identifying areas for improvement. The wish list included more structure and professionalism to the sales function, better knowledge and skills among their sales staff, and greater consistency. A detailed course outline was put together by Zest, tailored to 3D’s particular needs, which spelled out the content, key messages and outcomes. This was agreed and we then arranged the event. A full day training course took place at a local hotel with a dozen delegates from Ireland, London and Southampton offices flown in specially. The course combined theoretical learning, interactive workshops, group activities and role play. Feedback from all who attended the day was really positive. It was described as fun, relevant and fast-moving. Delegates reported coming away with a far better understanding of the company, its wide range of services and various internal processes. They also felt better prepared in a sales environment and perhaps most importantly of all more confident when closing deals. “Since the training course the construction recruitment market has picked up and I’m certain that our staff are now far better equipped than they were to capitalise on this opportunity and drive our business forward. The sales team are performing really well. Planning the event, and discussing the exercise with Zest afterwards, has definitely focused my thinking and that of my senior team on how we can invest in our staff to build the business. We have seen tangible benefits in terms of increased sales, improved customer feedback and improved morale among our team. We invested heavily in the event, flying staff from across the UK and Ireland to attend, so it had to pay for itself. And it did. 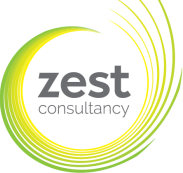 Zest put together an excellent course, delivered with great professionalism. Kristy’s marketing knowledge has triggered thoughts about the whole business and our future direction, which has been invaluable. We will definitely be using Zest again."